This is a quick and easy Tapas dish to prepare and very tasty. The most difficult part of this recipe is finding the Padron peppers. If you are in Spain, especially in the Galicia area, you find Padron peppers in abundance throughout the summer. Where we live in the San Francisco area, a few farmers grow the Padrons in hot houses all year round. 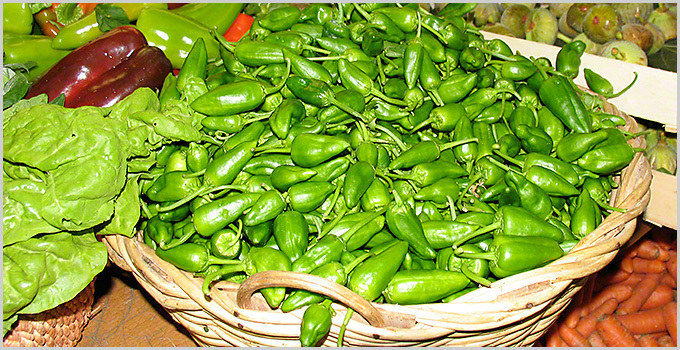 They are the source of the Padron peppers for Spanish specialty shops and Spanish restaurants. About the middle of June, we begin to spot these at the local farmers market. The farmers market at the Ferry Building in San Francisco is sure bet to find the Padrons during the summer months. Padron peppers are picked very early before they turn red and produce more heat. When they are green the peppers are mild. Once it awhile a hot will turn up but not often enough to discourage one from eating this wonderful tasting appetizer. Usually the person who is worried about the peppers being too hot will undoubtedly get the one hot pepper in the bowl. Serve with a glass of Albariño wine. We recently order a batch of Peppers Padron at the Coqueta restaurant in San Francisco. This restaurant is a Tapas bar in the tradition of Spanish dining. They put an interesting twist to this recipe by adding some strips of Serrano ham to the pan while the Padrons are cooking. The famous Spanish chef and restaurateur, José Andres, cuts the peppers and then fills them with a soft Spanish cheese and then fries them up as above.